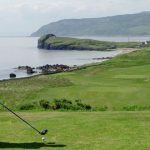 The results are in for Machrihanish Golf Club’s Jimmy Kerr Open, played last Saturday. Results: 1 A B Glendinning 85-18=67(BIH), 2 John Ramsay 86-19=67, 3 John Docherty 83-15=68 (BIH), 4 E White 81-13=68, 5 E Cappocci 76-6=70 (BIH). Scratch: 1 O Armour 72 (BIH), 2 Christopher Mackie 72, 3 Bruce MacNab 73, 4 D Campbell 75, 5 Martin Robb 76 (BIH). Seniors: Keith Abendroth 101-25=76. Ladies: 1 Elaine Robb 88-15=73, 2 Maggie MacArthur 98-21=77 (BIH). Ladies scratch: 1 Elizabeth Casey 84, 2 Ann Gallacher 91.